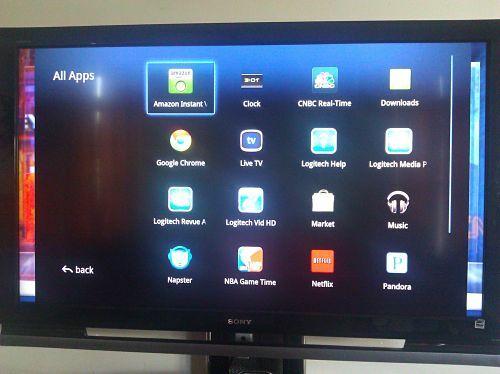 Last Wednesday (7-Dec-11), Google TV announced on its blog that “all units of the Logitech Revue™ will begin to receive an over-the-air (OTA) update of the new Google TV software”. 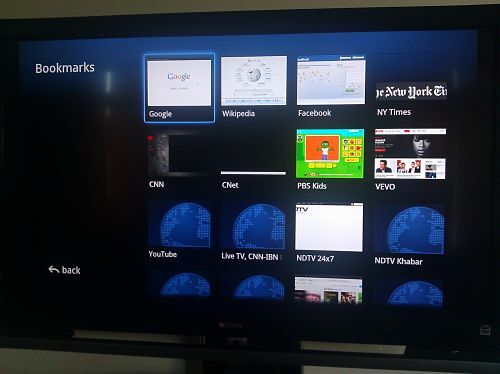 This update was much awaited and several weeks later than the update was announced for the other Google TV device – the Sony. Anyway, my Logitech Revue got its update yesterday (10-Dec). However, so far the software has not really lived up to its expectations — Google could have, and should have, done a much better job. Anyway, here is a detailed review of what works better and what got worse on Google TV 3.1. For the record, I tested it on a Logitech Revue (with a regular keyboard), hooked to a 51″ Sony Bravia LCD, connected to Comcast cable. Let me first talk about what got better. The interface definitely looks much better. When you press the “Home” key on the keyboard, you get a nice toolbar at the bottom of the TV screen. This toolbar contrasts with the vertical sidebar in the last version, which did have its advantages that I will come to later in this post. Anyway, the first icon in the toolbar is the “All Apps” icon. The second icon is the “Live TV” icon. 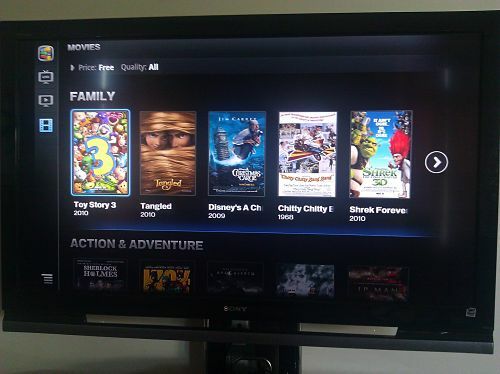 It is the third icon “TV & Movies”, which is the best feature, and perhaps the only better feature, of Google TV 3.1. This brings up a list of all movies and shows available — currently on live TV, Netflix, YouTube, Amazon, and so on. You can also change the time from “Now” to a future time and see what is coming up. Another great addition is the Android Market. However, other than some games, there was not much of my interest. I am sure this opens Google TV up to a large improvement in coming days and weeks. Earlier the “Home” screen had access to almost everything — Applications, Bookmarks, Spotlight, Chrome, and so on — all in the left sidebar, which is now gone. Now, when you go to the “All Apps” screen from the home toolbar, it only brings you to the Apps. There is no more easy access to Bookmarks. Since all my favorite online video sites were on “Bookmarks”, I need an easy way to get there. Unfortunately, the only way to get there is by opening Chrome, pressing the “Menu” button on the keyboard and choosing “Bookmarks”. The favorites key on the keyboard should have taken us there. Also there seems to be no way to delete existing bookmarks. Also, the earlier version of the software had an easy way to close a window — press the “Menu” key and choose “Close Window”. Now there is no easy way — you need to keep backing out of the window until you get to Home screen, or press “Menu” key, click on Windows and then click on the “X” next to the current window. Not user friendly at all. 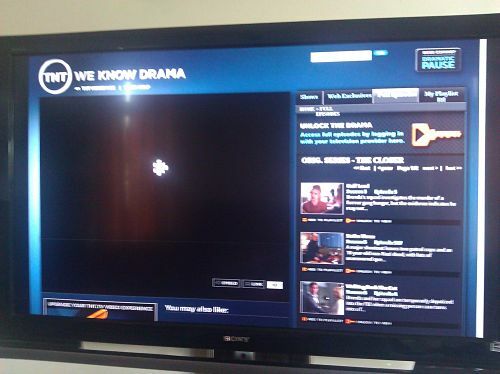 The online TV works as well as it did, as long as it is not blocked. 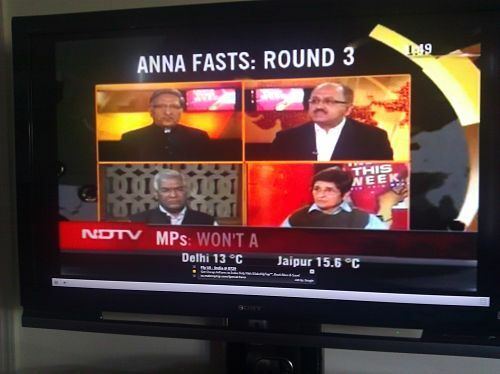 The following picture is from NDTV, a TV channel streaming online from India. All such channels in my bookmarks work fine. Also, other channels accessible via Google Chrome (e.g., youku.com, vimeo.com, etc.) work fine and offer a lot of content. 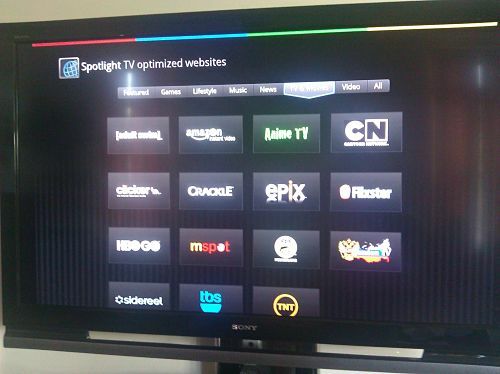 “Spotlight” is described as “TV Optimized Websites”, but doesn’t live up to its name for most items listed under it. 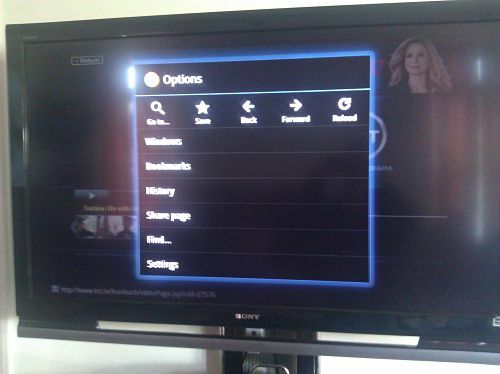 Well, the website interface is optimized alright, but the content is not made available for Google TV in all cases. Look at the following screenshots from TBS, TNT and Sidereel. The interface is fine, but there is no content to watch. 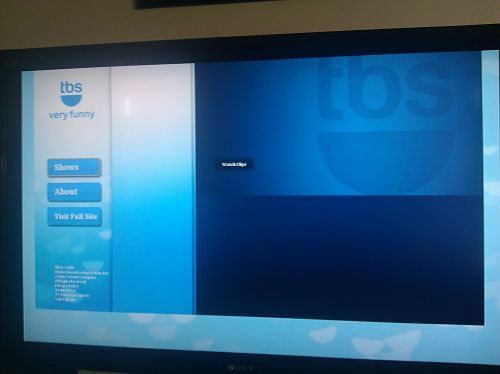 On TNT, there is an option to log-in to your cable provider account, but clicking on that option gets you nowhere. So much for “TV Optimized”. Then there is the already existing problem of major online TV resources, like Hulu and major TV networks, blocking its content from Google TV. Google 3.1 brings no solution to this issue. My cable provider is Comcast/xfinity. I can log-in to the Comcast website to watch content online on my PC. This I consider as paid content, because I am paying for access to Comcast. However, when I try to do the same thing on Google TV, it brings up a message asking me to install Microsoft Silverlight. Obviously, there is no way Google TV is going to allow me to install this add-on, and who knows if that is the only missing link. Maybe it works better on Dish Network, but it is not worth switching TV providers. In fact, I want Google TV to get me closer to cutting the cord, but right now I am nowhere near it. Fortunately, I bought my Logitech Revue recently for a measly hundred bucks, compared to the earlier price of $300, so I think I am getting my money’s worth with whatever I am able to watch, but Google is not coming up to its expectations, where Google TV is concerned. Why is the “Beta” sign not where it belongs most? All said and done, as I figure out easier ways of getting things done on Google TV, and get used to the interface, and as more items become available in the Android marketplace, I am still looking forward to a great experience with Google TV. This is a great review of the Revue. Initially, I though to buy this with a Bravia but later I bought the Google TV instead. I am enjoying the currently available features 🙂 and you are right about the not so easy access to most of the tools that we use. Am I ever going to be able to stream from ESPN3? I used to love to be able to stream directly from my logitech revue to my TV without my laptop. Unfortunately, it looks like I will still have to go that route. No one seems to be able to tell why the stream no longer works. I have emailed ESPN and have gotten no reply so far. Anyone out there help me out? I am still pissed about the bookmarks, that used to be my first key I would hit when turning on my revue. I will have to go home tonight and tryout your solution. 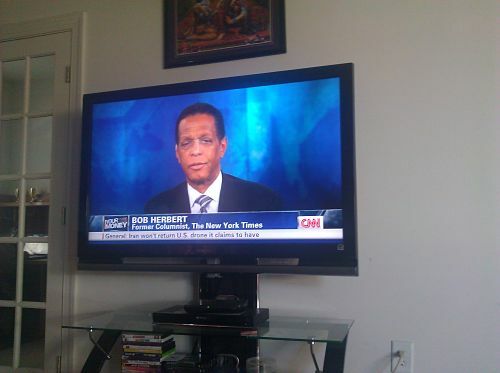 I have a cable box connected via HDMI cable to my sony 32 google tv, it works great. But…. I have connected the tv via optical cable to my receiver and I only get 2 channels of audio (stereo). There is no way, or at least I didnt find one to configure in 5.1. Do you know if this is a bug or something? 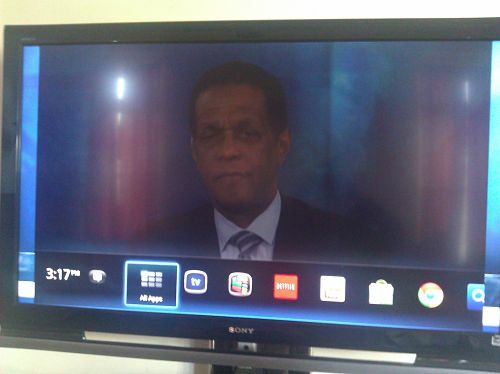 I try to connect directly from cable box to the receiver via optical cable and I get the 5.1 channels. So I’m sure the cable box is delivering 5.1. That’s the reason the problem is in google tv. The 3.1 update was a virus. I lost the ability to view Crackle.com movies. And, i lost the ability to view NBC.com Videos. I wish they would re-load the Last Version. You are right. The 3.1 “update” was really a downgrade. After reading your comment I tried Crackle, and it worked fine on my device. 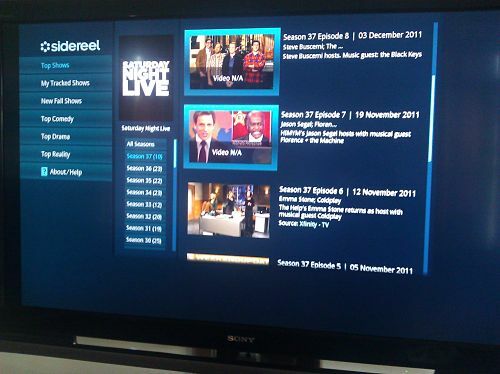 If you see this screenshot of the Spotlight screen, Crackle is listed in the second row. It is also the first item under “featured” tab. Regarding NBC.com, I never had success with the last software either because all major networks are blocking their content from Google TV. i’m having the same problems. the main problem i’ve found is deleting the bookmarks. To delete bookmarks, cursor to the one you want to delete and then hold the ENTER key for a few seconds. A box will appear with many options, including delete bookmark.